My mother was always anxious about her matzo balls. She was proud of them — and yet she was, too, on a never-ending quest for perfection, a quest dogged by the fear of failure, a fear balanced between the search for lightness and the need to hold things together, a balancing act which echoes almost every dilemma in life. Some folks, of course, knew no such worries. At Kaplan’s Delicatessen, on 59th Street — where my grandmother would order a tongue sandwich sliced from a disturbingly human-looking (if hugely engorged) organ that sat perched, raspy taste-buds and all, above the counter — the matzo balls were Sinkers, dense and compact, the size of billiard balls, tasting of almost nothing, carrying within them the memory of food you ate to fill you up because you had no other choice. My mother scorned such matzo balls: she was after vigor and vibrancy, spring and surprise. For a while her matzo balls were so light they threatened to disintegrate in the soup that bathed them; “matzo klops”, she called them, laughing, but they were delicious all the same. I didn’t help her make them. She was too nervous to let me help. Now she’s been gone for just five years I thought — finally — I would experiment again with making my own. A few of my innovations would cause her horror, but I like to think the end result would make her proud. All I’d like is to be able to share a bowl of chicken soup with her, so I will share this with you, instead. In a large bowl, combine matzo meal, salt, paprika, baking powder and baking soda. In a medium bowl, whisk 2 whole eggs with 3 yolks, schmaltz and chopped onion. In a separate bowl, beat the 3 egg whites with an electric mixer until you get stiff peaks. Stir the schmaltz mixture into the dry ingredients, then gradually stir in the egg whites and the parsley and coriander until everything is incorporated. Cover with a sheet of cling film pressed directly onto the surface of the batter; and refrigerate for about 20 minutes or overnight, until firm. Heat the 2 tbsps olive oil or schmaltz in a big soup pot/Dutch oven. When it’s hot, add the chopped onions and celery and cook down gently for at least 15 minutes, until everything is nice and soft. Add salt and pepper, and then stir in the turmeric, which just gives things that extra bit of depth, and also a nice extra yellowy colour. (This is another addition that would have appalled my mother, I’m sure.) Add the stock and the thyme and let simmer away for 20 minutes until everything sort of comes together gently. Meantime — heat your oven to 200ºC and lay your chicken thighs in a roasting tray — you can put some sliced onion underneath them, if you feel like it. Salt and pepper them. Roast for about 35 minutes, until they’re done — you’re going to pull the meat from the bones and add this to the soup at the very end. Much better than chicken that’s been boiled and boiled in the soup! Trust me. Again, not sure my Mom would approve, but hey. Now you are also going to put a pan of boiling salted water on the stove and cook the orzo until al dente. Drain, and set aside in a bowl with a little butter stirred through. As your soup is cooking and your thighs are roasting, make your matzo balls now that the batter is nice and firm. 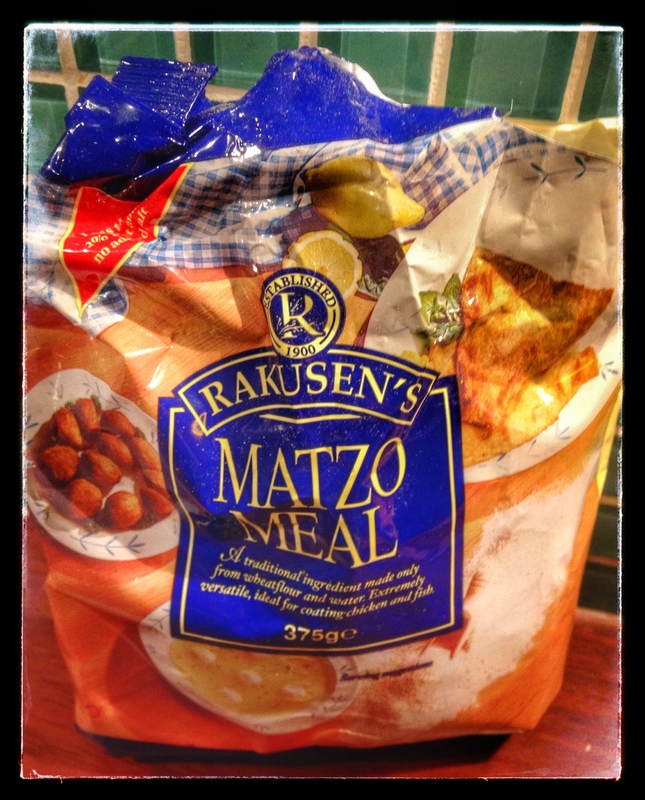 Have a tray or a plate ready scattered with a little matzo meal. Me, I like small matzo balls, not great cannonballs, so I take about a tablespoonful of mixture and roll it in my palms (which I have lightly greased with vegetable oil) to make a not-too-firm, not-too-loose little ball. See? That wasn’t so bad. When the matzo balls are done you can stick them back in the fridge, lightly covered with cling film, until you’re ready to cook them. Add the carrots at this point, because you don’t want overcooked and soggy carrots in your soup, do you? No, you don’t. When the liquid has come back up to the boil, gently drop in your matzo balls and allow to simmer for 15-20 minutes. Test one to see if it’s cooked through — yum yum — and if it is, stir in the chicken and the parsley. Serve in heated bowls, into which you have put a few generous spoonsful of the cooked buttery orzo. There you have it, the stuff of life. Nothing better. And I’m pretty sure — coriander and turmeric included — my Mom would be proud. Because she always was. She was my Mom. *I made my own schmaltz! My mom never did that, I tell you. It was easy! I trimmed some of the skin from the chicken thighs I had ready for the soup; I fried up the little scraps with salt and pepper and onion in a little non-stick pan and just kept pouring off the fat. Voilà! And this meant by son got his first taste of gribenes, the crispy fried chicken skin you’re left with. A double win, or what?